Signed DENBY Danesby Ware Pottery. Marks: Signed on the base. Manor Green. Three Soup Bowls with lids. Denby regency green straight sided mug. Very good condition. Other items listed in this pattern. Manor Green. TWO Soup Bowls with lids. Cheque (drawn on UK Bank in sterling only. ). Vintage Denby Troubadour tableware in good pre-owned condition, no chips or cracks. Includes 4 dinner plates measuring 10" diameter, 5 side plates measuring 8" diameter and 2 bowls measuring 5 1/2" diameter by 2" high. Not all have Debby on the base. Ideal for someone looking for spares or looking to increase the size of their collection. Free p&p to mainland UK. VINTAGE Bourne Denby Studio Pottery. Condition is Used. Consisting of 3 bowls, 3 cups, 2 small bowls and 3 tea plates. One cup has a tiny chip on the rim. Message me with any questions. Collection from Norwich. I have for sale a amazing example of 1930s style Denby Bourne Terrie book ends. These were products in a couple of colours however this beautiful random glase of soft blues and greens in a dripped satin finish is particularly attractive and points to the period perfectly. Here is a retro set of 4 x Denby Potter's Wheel Stoneware 17cm Side Plates. Attractive vase, decorated in art nouveau/art deco style, circa 1920, by Maud Bowden, a Senior Assistant at Doulton Lambeth from 1903 to 1937. Lovely, rich mauve-blue ground garlanded with anemones. Denby Green Wheat Cereal Bowl x2. Condition is Used. Dispatched with Royal Mail 2nd Class. Denby Intro Bistro Black Soup / cereal bowl. Very good used condition. There are 3 available one bowl has a small manufacturer imperfection.The bowl with the imperfection will be the last one sold. please view all pictures for your own opinion. Very cute Denby pottery 'Byngo' French Bulldog Puppy. 3 1/2', 9cm Green and black glaze. A later version of the original 1930s model. 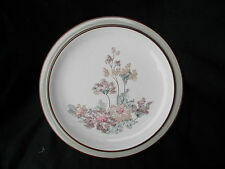 RARE VINTAGE DENBY HOMESTEAD BROWN LARGE 2 HANDLED ROASTING DISH 16.5"
Marks: signed on the base. Vintage Denby '2pt Teapot CHILLI ? The set is in excellent condition and consists of . A nice twin handled vase by Bourne Denby. Painted Flower design along with twin green, rope twist handles. Clear hallmark to base. This set of plates will be a great addition to your Denby Midnight dinnerware allowing you to seat more guests or update worn or tired pieces in your set. 'Midnight'. Six Side Plates. The Plates are in good condition. 10in from handle to tip of spot. (Back stamped 'Denby Made in England'. cm) high and hold 7 fl.oz, nice size for coffee. Marks on the bottoms are the rounded corner rectangular "DENBY" type. There is a tiny mark to the glaze on the spout (see photo). Denby ROMANCE. Side Plate. Diameter 7 3/8 inches.